OSU could break a 17-year record with a good showing against Iowa. 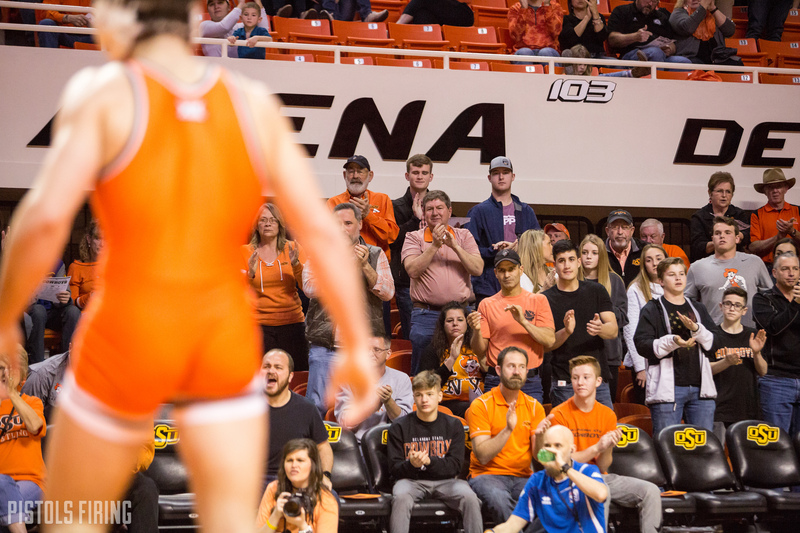 I’ve been tracking the average attendance at wrestling duals this season and OSU has set itself up for a shot at breaking a record for its highest average over a full year. After that first writeup on the record average, attendance dipped a bit in the final three home duals and here’s where OSU stands now. The average numbers have been tracked all the way back to 2002. Just two years prior to that the arena capacity was only 6,381. Tracked attendance numbers don’t go back any further that I’m aware of. But with the smaller arena the natural assumption is the record was not higher and this would be an all time record average. There’s really no official way I’ve found to confirm. Here are the numbers from the last four home duals where OSU wrestled Iowa. So OSU would need 4,112 more in attendance on Feb. 24 than it had its last meeting at home against Iowa to break the record. They put Gundy in a singlet a few years ago and set a Gallagher Iba record vs. Penn State with 14,059.
Who knows, maybe Gundy will take his talents to Twitter again to give the Cowboys a boost.